NASA Earth Observatory images by Lauren Dauphin, using MODIS data from LANCE/EOSDIS Rapid Response and Landsat data from the U.S. Geological Survey. Story by Adam Voiland. When lightning storms passed over the Canadian province of British Columbia in July and August 2018, they ignited several hundred fires in forests that were already primed to burn. Abnormally hot, dry weather had stressed vegetation and parched the soil. And infestations of mountain pine beetles had left many forests with large numbers of dead trees. 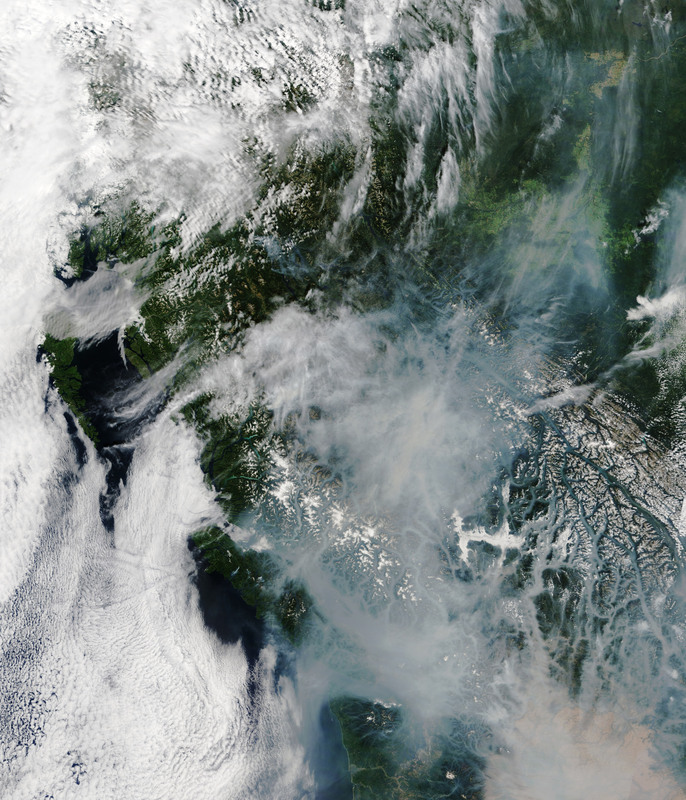 The Moderate Resolution Imaging Spectroradiometer (MODIS) on the Terra satellite captured this image of British Columbia�s smoky landscape on August 13, 2018. 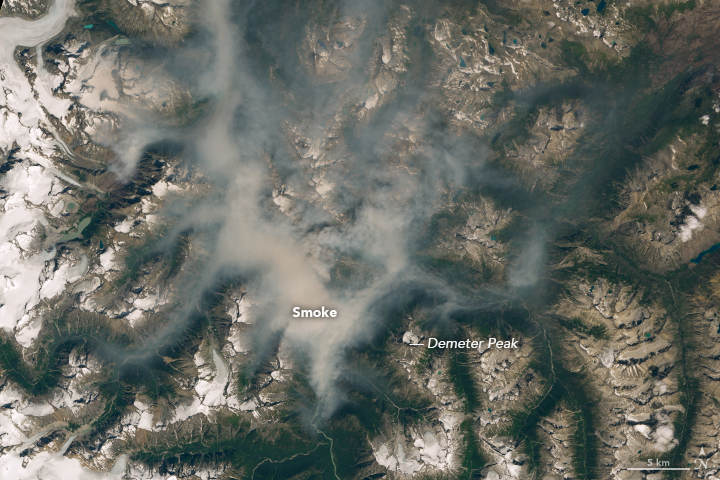 Some of the thickest smoke lingered in the valleys, but plumes had also spread well beyond the province into Washington state and deep into the U.S. Midwest. Plumes of wildfire smoke can have a significant impact on people and the environment. Small particles in smoke pose a health risk because they can easily enter the lungs and bloodstream. And dark particles in smoke can land on snow and ice and accelerate melting by absorbing heat and reducing the reflectivity of the surface. 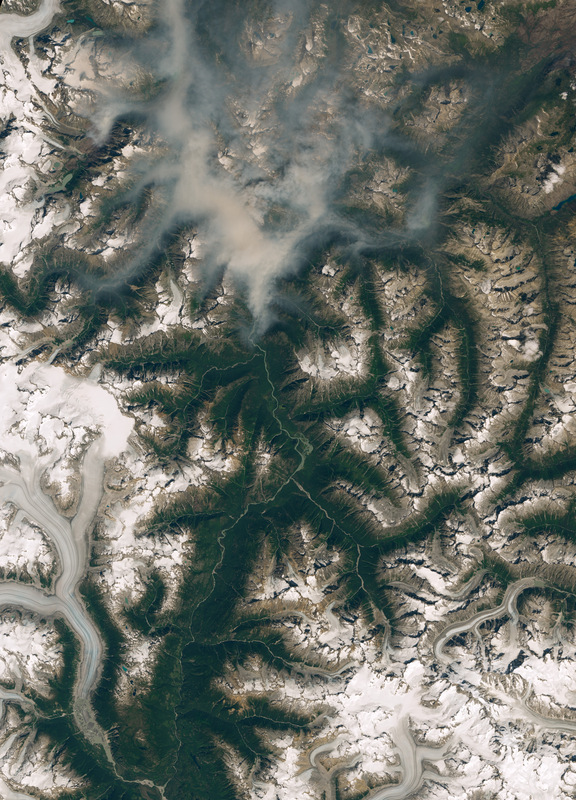 The Operational Land Imager (OLI) on Landsat 8 captured this natural-color image of smoke lingering in valleys near the snow-capped peaks of the Coast Mountains on August 7, 2018. CBC (2018, August 13) Smoke from hundreds of wildfires darkens skies over B.C. Accessed August 14, 2018. Cliff Mass (2018, August 14) Smoke Storm Hits Washington State. Accessed August 14, 2018. Global News (2018, August 13) B.C. wildfire update Monday: More fires now burning than during record 2017 season. Accessed August 14, 2018. 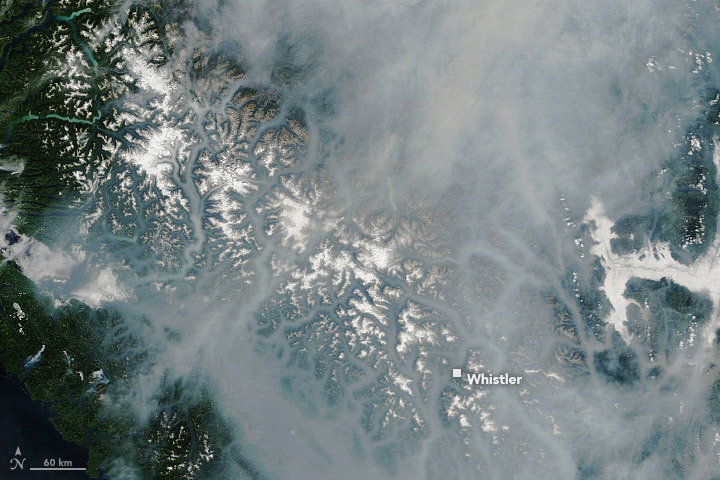 NASA (2018, August 13) Smoke from BC Fires Blankets Canada and US. Accessed August 14, 2018. The Globe and Mail (2018, August 13) Air quality suffers, evacuations and alerts grow in B.C. following rash of new wildfires. Accessed August 14, 2018. The Washington Post (2017, June 26) Scientists just proved that wildfires dumped a huge amount of soot atop Greenland’s ice sheet. Accessed August 14, 2018. University of Wisconsin (2018, August 11) Wildfire smoke across the Midwestern US. Accessed August 14, 2018. Wired (2018, August 14) Wildfire Smoke Is Smothering the US—Even Where You Don't Expect It. Accessed August 14, 2018.